This is a comprehensive collection of board games based on music. 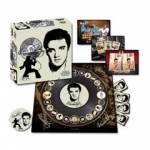 These titles include music trivia games, music-themed versions of popular games such as Monopoly and Trivial Pursuit, and even party games that let you (or is that make you) sing along. Quick, think of a song with the word "love" in it, and sing at least six words of the song. Hurry, though -- the timer's running. You don't have to be able to carry a tune to play this game, but you do have to know a lot of songs and have a good memory. Encore is a great party game for all ages. Includes 96 cards with six clues each, game board, timer, die, three pawns and instructions. For two or more players or teams. Is it fact... or is it crap? Only you can determine the outcome in this game. Test your instincts against those of your opponents. 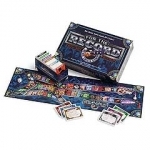 Fact or Crap is the best selling board game-- and is now available in a Music edition. Hundreds of new specially written questions pertaining to music from all decades and types. Comes complete with new look tokens, timers and, of course, Rush Hour questions. For 3 to 8 Players, ages 8 and up. This is a single poker-sized deck of playing cards featuring Fender's beautiful custom guitars and amps.Enjoy hours of fun playing cards with this amazing 52 image deck featuring guitars and amps from one of the world's leading manufacturers, Fender. Teles, Strats, Deluxe Amps ... they're all here in this officially poker-sized deck with a linen type finish. For anyone who's ever sipped a cocktail ringside at a Sidney Leibowitz and Eydie Gorme dinner show, or saw Diane Earle and the Supremes on American Bandstand, have we got a board game for you. For The Record takes a standard '50s-through-'70s, multiple-choice trivia game and adds a touch of reverb here, a funky wah-wah pedal there, with categories including the above represented Real Names, deceased rockers in Rock n' Roll Eternity and One Hit Wonders. Players or teams complete a tour around the tongue-in-cheek board as they answer music trivia from decades past. But be careful to not get sent to Disco Purgatory! For The Record 80's & 90's Edition covers everything from rap to reggae, alternative to country, pop to punk and more! It is more than just a totally cool game, it's a way to get friends and family to hang out and have a totally awesome time! The multiple choice format and clever board design (watch out for the mosh pit) make For The Record challenging enough for trivia buffs, yet equally fun for people who simply love music. So, put on your favorite tunes, grab your buds, break out For The Record and go back to what was your future! It's the fast-find song frenzy that pits your playlist against your friends' in a simultaneous music challenge for up to four players! Connect up to four MP3 players (not included), and let your fingers do the flyin' as you show what you know about your music collection. When you're done playing, use the console to play your favorite music! Plus, the console stores everything, making it easy for you to take this tune-tappin' song-matching game anywhere you go! Game console comes with cables, 60 cards and instructions. Riff is the music trivia game that will rock your memories. We'll challenge your recall on groups, music videos, songs, lyrics, album covers, and more. From Grunge to Rap, Pop to Heavy Metal, Classic Rock to Alternative, Riff's got it all! Two teams compete through a series of puzzles, videos, and challenges to see who really is ready to face the music. Grab the remote, put the DVD in the player, and get the party started! For players in two teams, ages 12 and up. Boom-Boom Clap. Boom-Boom Clap. We all know this famous beat, so get ready to start clapping! In this outrageously funny party game, each player is given a unique hand symbol that they must watch out for. 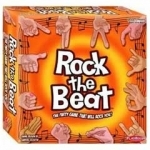 Everyone starts the beat and if an opponent makes your symbol instead of the clap in the beat, you must respond with your own symbol and then one of another player. It may sound easy, but wait until you're rockin' out with multiple symbols and laughing too hard to catch your opponents making yours! For 4 to 12 players, ages 10 and up. Contents: 40 playing cards and instructions. For those about to rock, we salute you! Experience life as a rock star - rising to fame, getting millions of fans, making loads of cash and retiring at the Rocker's Hall of Fame. Get on the Rock 'n Roll Highway and start your garage band, perform at the Red Roxy Amphitheater, get your first single on the radio and build fame and fortune. Live a rock star life, build your career, reach superstardom, become a Rock Star legend and retire at the Rocker's Hall of Fame! 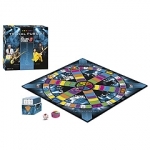 It's Only Rock 'n Roll...but you'll like it in this Rolling Stones Collector's Edition of Trivial Pursuit. For the first time ever, one of the most legendary rock 'n roll bands teams up with America's favorite trivia game so fans of all ages can get some satisfaction by showing off all they know about the Rolling Stones. With over 2,000 questions from six categories covering the band's history, music, accomplishments and more, there's enough trivia for fans of all levels. So get your friends and neighbors together for a game you'll want to play 'til the whip comes down! Game includes custom die and playing pieces featuring the iconic tongue and lip logo.